Do You Know East Greenwich? 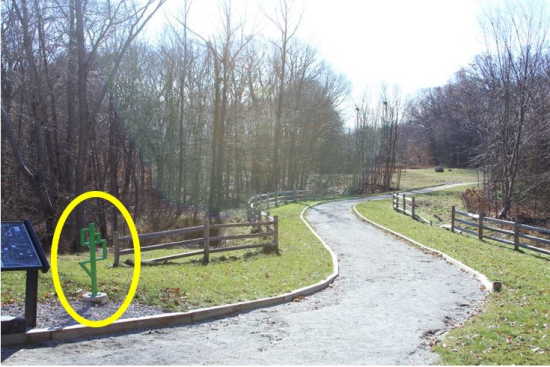 This bright green, artfully designed bike rack is on the East Greenwich Nature Trail. It is meant to encourage bicycle commuting to school and athletic events and stimulate more interest in bicycling for general recreation. It is located near head of the nature trail. The East Greenwich Nature Trail is a beautiful 3.1-mile crushed stone and dirt path with beech trees and streams for all to enjoy. This awesome trail begins at the end of the access road between the playing fields at East Greenwich High School and is open to the public for general recreation. The bike rack was a gift to the town from The Steel Yard’s Public Projects department. It was created in their Weld to Work Program, a job readiness program designed to expand the employable skill set of participants, to improve their odds of securing jobs in local industries. The racks are an amenity that encourages biking for both transportation and recreation and they also serve as a great learning project for beginning fabricators and welders.